“Change is inevitable. Change for the better is a full-time job.” Adlai E. Stevenson II. A TALE of Two Cities is Charles Dickens’ second historical novel; it was published in 1859 when Dickens was 47. The novel is set in London and Paris during the French Revolution, a time of significant upheaval and reassessment for both cities. The theme of duality—”It was the best of times, it was the worst of times” is prominent in the novel. Dickens’ portrait of Paris emphasizes the turmoil of the capital. In summary, change was one of the underlying themes of the novel. The book is a collector’s item. Though Lagos State is not in turmoil but there certainly seems to be an upheaval in the transportation sector. When asked, what the colour of Lagos State is, the available reply would have to be yellow. From Ojuelegba, Apapa, Okokomaiko to Maryland, Ikorodu, Ojota, Obalende and the popular Oshodi, yellow buses are everywhere. In the 80s, when news reels of Lagos State were shown on the screen, Oshodi was the favourite part of Lagos that was shown. Oshodi was probably the same shot/scene used by artists or painters. 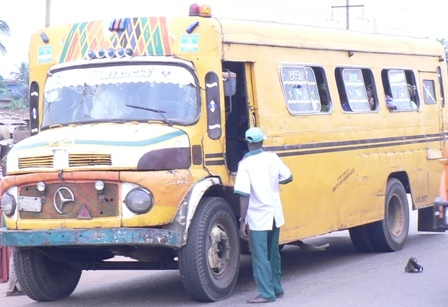 The yellow colour was ubiquitous and still is; not minding the covert attempt to erase the grand daddy of all the yellow commercial buses better known as molue in these parts. As aforementioned, change is inevitable; no doubt, but the challenge I have would be illustrated in this article. Several years ago, molues were barred and banned from the Oshodi-CMS route and in its place were the white city buses. But at present, a lot of the white city buses have turned into moving relics; not more than a decade after these buses took over the Oshodi, CMS route. Some years ago, the Lagos State Government introduced the red BRT buses. These buses (LAGBUS) were brand new, fully air-conditioned and everyone had to be cultured once onboard these buses. Shouting, fighting, religious semi-crusades, merchandising and hawking were prohibited unlike what is obtainable and can be found onboard molue buses. Lagosians began to conform to societal civility and they began to be patient on long queues in order to board the buses. An unbelievable and uncharacteristic trait of Lagosians in the 80s, 90s and early 2000s. But what is the present state of the Lagos State operated BRT buses? Kindly board a state operated BRT bus from Ajah to Obalende and CMS or from Oshodi to Sango-Ota and environs and you would wonder if it were the same Lagos State operating other versions of the BRT buses operated by private firms. Majority of the BRT buses have transmogrified into classic molues. Don’t misconstrue the previous sentence; molue is part of our national heritage. No matter your social strata, if you haven’t boarded a molue, then you haven’t experienced Lagos in its entirety (lets skip the poshness, glitz and glamour for a while). Not having that molue experience in Lagos, is like pretending or confessing that you haven’t tasted locally prepared honey beans (better known as ewa aganyin) with “just escaped from the bakery” Agege bread. It is like saying you have not tasted “pure water”-(water in a sachet). It is like a Russian or a Chinese saying they haven’t boarded the locomotive trains and the bicycles, in their respective countries. It is like a Mongolian who lives in the country’s capital-Ulaanbaatar (pronounced Ulan Bator) saying he/she doesn’t know anything about herdsmen, animals and their role in transportation (when the nation is a nomadic country). It is like a Londoner saying he/she hasn’t boarded the ubiquitous red double-decker buses or the train tube. No one can be as aristocratically refined, sophisticated, polished as Prince Charles, who rides the tube once in a while. With certainty, there are and would be influential Nigerians who have boarded molues in the past. A molue bus is a Mercedes Benz 911. Practically all the molues in Lagos are on their last breath. An average molue is rickety (so also the BRT buses) with a body that has visible tales of several decades of harsh weather-bashing and panel-beating. Some have to be pushed and kick-started before their engines are revved. Most of the engines are best left in World War 1 and 2 museums. On board a molue, there are five classes of passengers. The face to face/self contained apartment, which is right beside the main entrance and the driver. There is the three bedroom apartment (which can be quite comfortable if you are by the windows and not on the extreme end beside the standing committee passengers). This section is comfortable if you are not seated on the second row. This is so because if you make that mistake, you would be bombarded by a sales person always seated on the first seat. The bombardment isn’t confrontational. It begins when the molue begins her tedious journey which would be elaborated upon much later. There is the two bedroom compartment which has two seats. Sitting by the window is the best option. This way, you also avoid the standing committee members with odoriferous smells like offensive halitosis (bad breath) or induced flatulence, which if released into the already congested molue. Curses would rain down like Majek Fasek’s classic tune (Send down the rain) but the culprit wouldn’t own up to his/her fresh chemical gas-like crime. In fact, the culprit might be among the vociferous abusers. Then you have “the bungalowers”. They are usually between six-eight people sandwiched on the longest bench or seat at the back. For these ones, the only source of ventilation is usually a tiny window on the left side of the molue but never from the second entrance, because the two conductors would need to pack more “impromptu” standing committee members. The standing committee passengers are sandwiched between all the other seated passengers. These are people who can’t afford the “exorbitant fare” for the seats or who are in a hurry and don’t want to wait for another molue. It takes more than guts and an overdose of patience to be a regular member of the standing committee. Woe betides the “brethren” of the standing committee in traffic lock-jam spots like PWD-Ikeja, Mongoro, Iyana-Ipaja or Meiran-Ijaye—where several years ago, traffic jam records of between three-five hours or more were broken every other blessed day. The disadvantages of the standing committee are numerous. You stand throughout the journey unless someone seated, alights. And even at that, your reflexes have to be faster than a gymnast’s and that of Usain Bolt put together to secure the vacant seat. You are likely to get your pocket picked (without your authorization!). You are at the mercy of the driver’s incessant swerves and brake-induced sudden halts; making you constantly gripping anything possible and I mean anything in sight. Also, some standing committee brethren are regular hitch-hikers. They usually don’t have money to move around and they inform the conductors that they don’t have any money. The conductors might shout for all the care in the world, but these no money commuters would stick to their story and eventually get their wish. Then, there are some who would never pay their actual fare, telling the conductors “jo soju nu/ba gbe”-loosely meaning overlook the money /that it like it is. Also, there is no space/elbow room for the standing committee members. It is as up close and personal can get. And finally, you have the “hangers on/let me manage crew” who hang by the first and second entrances. ← Registration For The Next Titan Season II Entrepreneurial Reality TV Show Is On!